Opening up the letter box this morning I was surprised to find a smallish parcel from a good living history friend from Victoria, Australia. 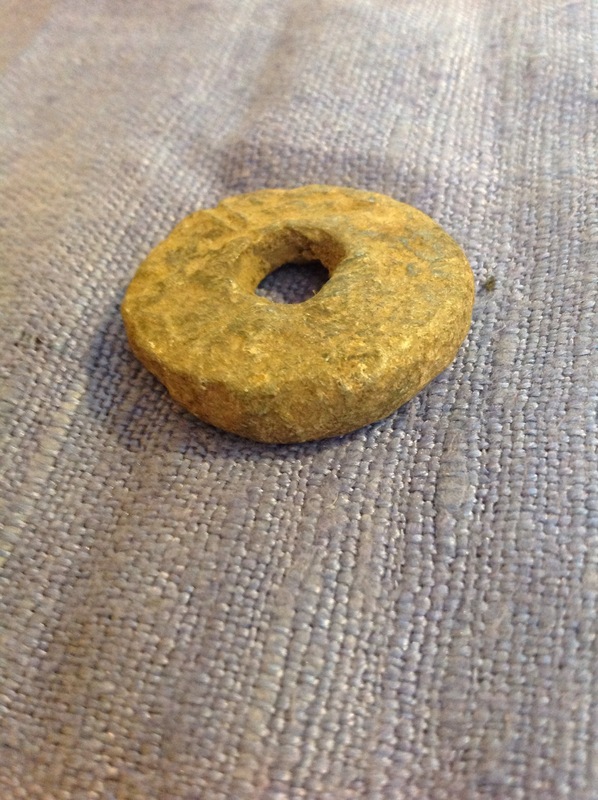 Josh (my friend) knows just how much I like messing around with period drop spindles and spinning period wools with them and was fortunate to come across an original spindle whorl. He then thought of me and posted off the little treasure. After initial squees of delight and marvelling at the weight of the whorl, (which Josh told me was because it was made of lead) he gave me a bit of info about the providence of the spindle whorl. I want to now make a spindle for it and give it a go, spinning some fibre with it and see how well it works. Its a bit lop sided, maybe it was squashed somewhere in time or has worn away a bit. Don’t know how badly it will affect its usefulness. How astounding that over 1000 years ago someone may have used this spindle whorl to spin wool like I am doing today. A good tool, works no matter the time period it would seem.